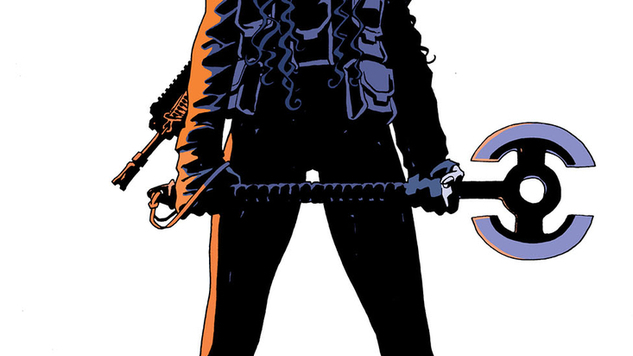 In the opening pages of Greg Rucka and Leandro Fernández’s The Old Guard, a woman named Andy reflects on a past filled with wars and lovers. The audience learns she can be cold to people she doesn’t know, she remains cool in the face of intense situations and she feels at home nearly anywhere around the world. She’s also a member of a group of four mercenaries recruited by an old contact, a man named Copley, for a dangerous rescue mission in South Sudan. Andy and her fellow soldiers at the center of The Old Guard are immortal, and they’ve worked together for centuries. This scope creates a tension beyond the comic’s international thriller foundation: betrayals and secret information abound, but the unkillable nature of the central characters adds new conflict. This debut issue features abundant violence, but the biggest threat to its characters doesn’t come from the barrel of a gun—it’s the fear of their biggest secret being exposed. The Old Guard isn’t Rucka and Fernández’s first collaboration—their working relationship dates back to an arc on Queen & Country in the early 2000s. And the mood for this foray, much like the Rucka-penned Lazarus, blends two of the author’s obsessions: the personal lives of professional combatants and surrealist twists. In this case, it isn’t clear whether the quintet became immortal through fantastic or sci-fi methods—though the credits page refers to the book as “a fairy tale of blood and bullets.” The miraculous recovery of another character, Nile, in a parallel plotline suggests that Rucka plans to explore some of this worldbuilding in the future. Fernández’s artwork memorably captures the globetrotting diversity of the series. He’s as comfortable showing a conversation in an urban cafe as he is depicting a tense military standoff in a rural village. One location late in the book—an empty room awaiting carnage—is ominous in its simplicity. So, too, is his rendition of the central characters as they embrace war with a passion and savagery that contrasts boldly with their numbness in more mundane situations. Daniela Miwa’s coloring also stands out, lending the variety of scenes different moods and helping to create distinct senses of place for each setting shift. With its first issue, The Old Guard is off to a promising start. This introduction establishes a solid balance between its supernatural elements and gripping action, generating several compelling mysteries along the way. Also: a giant battle axe, which is rarely a bad thing.